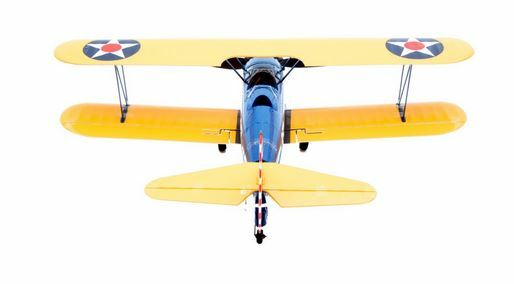 A venerable American trainer of yore, the Boeing Stearman PT-17 was used by the US Army to train thousands of pilots during World War II. The post-war era saw it pressed into service in a variety of roles, including crop dusting and airshow performances. Hundreds of PT-17s endure and fly to this day. When designing this micro sized model of the PT-17, E-flite chose to model the beautiful specimen owned by Pat Hartness, founder of the Joe Nall event held at Triple Tree Aerodrome in South Carolina, USA. 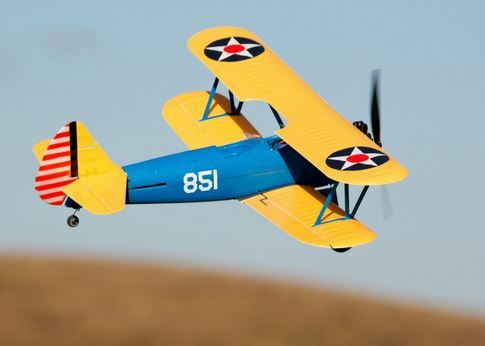 This detailed and scale model of the vintage biplane features four-channel control and AS3Xtechnology for rock-solid handling. The authenticity of its distinct outline is complimented by the dummy radial engine and colorful scheme. All that is required to ready this model for flight are a few minutes of assembly and a minimum four channel Spektrum DSM2/DSMX 2.4GHz transmitter. Visit your Local Hobby Shop to pre-order or click over to Horizon Hobby! Next Video: Avios Hawker Sea Fury FB11 In Action!